Carbon steel welds are almost flawlessly done with a MIG welder. There are very few problems, beside the downside of the design of a MIG welding machine. The wire stiffness is just right to pass through the liner from the machine with minimal friction to cause problems and has enough stiffness to be feed without coiling up. 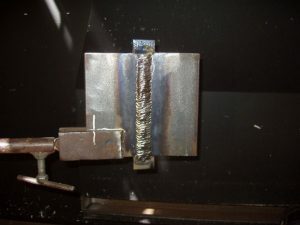 Depending on how much voltage the MIG welding machine is running at, the weld can be set to one of three transfer types, short circuit, globular, or spray. Joint preparation for carbon steel is the same as if you are stick welding with an E7018. 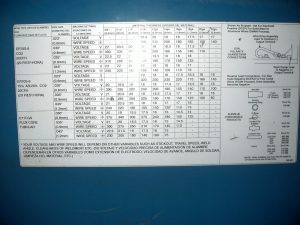 The weld area needs to be free of oils, paints, heavy rust, and in most cases mill scale. Ideally you want to grind the joint area back about 1 ½ of an inch to clean metal. All joints must be braced to avoid distortion from weld shrinkage. When it comes to welding heavy plate you will need to brace your joints more than thinner metals. The shrinkage from multi pass welds will distort the joint to the point where it is no longer square. Carbon steel electrode and gas selection is pretty easy. 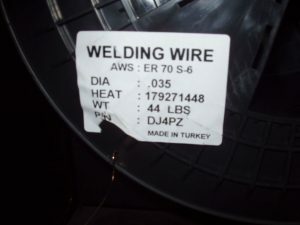 In most cases the filler wire will be “ER70s-6". The gas choices are either straight Co2 or a C25 Gas that consists of 25% Carbon Dioxide and 75% Argon. The C25 mixture does produce better weld quality but also cost a bit more. Beside the gasses and electrode mentioned above there are many electrodes, mixtures and combinations that can also be used. If you are welding in a shop there will be a welding procedure that will tell you exactly what to do. If you are still not sure what gas and filler wire please call or visit your local weld supply shop. 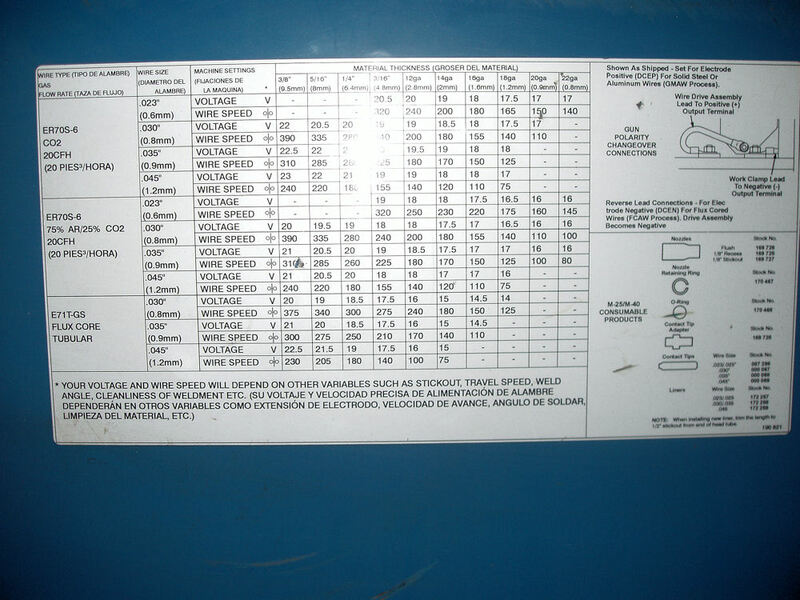 Another option is if your MIG welder has a welding procedure electrode and gas selection chart inside then you can follow that like in the picture below. For thinner metals such as sheet metals they are almost always welded in short circuit transfer. Short circuit welds well in all positions and it typically uses 100% Co2 gas. In some cases a C25 gas is if weld appearance needs to be at its best. This type of transfer has a high pitch fast crackling sound and it works best with a tight whipping motion. The whipping motion provides a little preheat of the joint before filling the crater back again. This is very much like welding an open root weld and controlling burn through. Globular transfer is typically used on plate that it at least 1/8 of an inch or thicker. 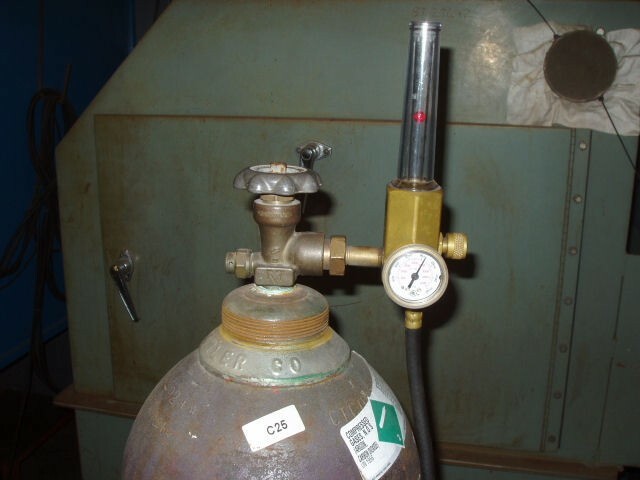 There is always Argon gas in the mixture and it works best on outside corner welds or fillet welds. There is a popping sound to this transfer type and you can actually see globs forming and falling into the joint. Globular works best in the flat, horizontal and vertical positions. It can be done in the overhead position but that is very difficult to do. Spray transfer can be one of two types and is used on thicker metals. Spray is achieved with higher voltage settings, lower wire feed speed and a high percentage mix of Argon gas. True spray transfer has a hissing or humming sound to it and is typically only used in the flat and sometimes horizontal positions. Spray transfer that is defined by amperage, a weld procedure or voltage that is used on thick plate to penetrate the weld. This type of transfer works well in all positions and has a fast deep crackling sound that almost roars. Pulse spray is used on carbon steel for either, thin metals, open roots, all position welding and pipe. Pulse spray is mostly used for MIG welding out of position pipe and it is a nice luxury to have. 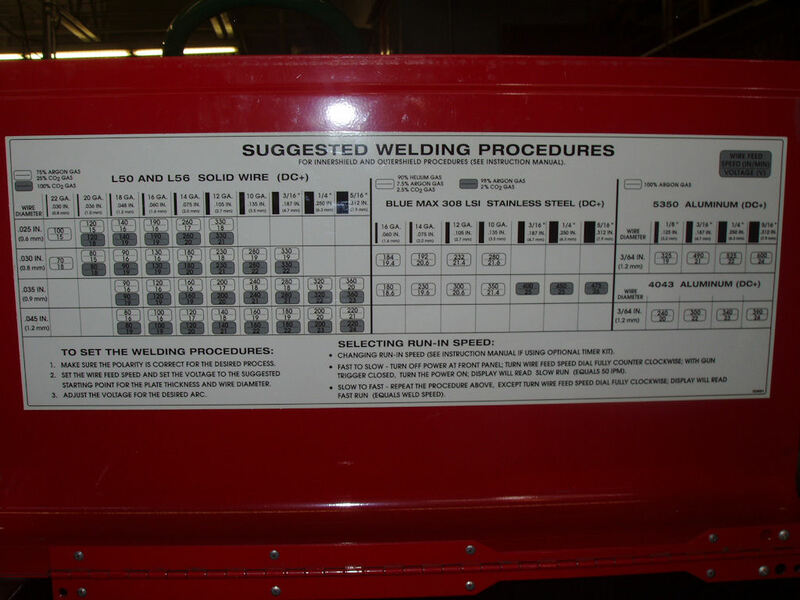 Most MIG welders have a chart inside of the machine that can give you some general guidelines about how to set you machine for the right material thickness. These are always just guidelines and you need to test the settings on a piece of scrap metal to make sure they are welding properly. 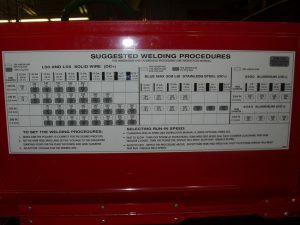 Just in case you don’t have a machine setting chart there is a picture to the right that has one from a Lincoln MIG welding machine below (all pics on this site open up bigger) for you convenience. I do want to mention that MIG welding of any kind is all about machine set-up and that is where the skill is needed. Welding carbon steel is easy and does not have any real obstacles. It welds fine in all positions and produces a quality weld. The only possible issue could be from welding in the vertical up position. This position typically requires a groove because the weld is always very convex. Another issue to watch out for is cold lap. MIG welding can produce poor quality welds if the welder is not run hot enough. Besides that it is a excellent choice for welding in a shop because it makes good welds that are clean and require very little dressing. 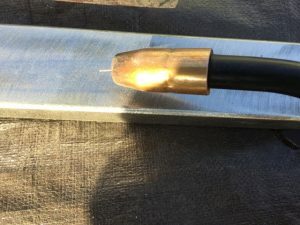 Spatter can be a issue once in a while but that is solved with anti-spatter spray or just a light scraping after welding.